Posted on Fri, Mar 30, 2012 : 11:51 a.m.
Michigan's two flagship public universities face the loss of millions of dollars in state funding if they do not acquiesce to the state Legislature on key social issues. A Michigan House subcommittee on higher education is threatening to withhold up to $7 million in 2012-2013 budget funds from the University of Michigan and Michigan State University due to disagreements on embryonic stem cell research, mandated health insurance and student protests. The subcommittee agreed in a party-line vote Friday morning to tie $36 million in government funds to a performance formula proposed by Gov. Rick Synder, but added additional metrics related to the social issues despite oppositions from Snyder. The subcommittee, meeting in Lansing, approved a $1.4 billion education budget, a 3 percent increase from last year. The budget will now go before the House Committee on Appropriations for approval, after which it will be headed for the house floor. Snyder's proposed formula, which has been criticized by several public university presidents as unbalanced, distributes a 3 percent increase in state funds based on tuition restraint, improvement in graduate rates, critical skill degree offerings and the number of pell grants a university receives. The subcommittee, however, added additional strings to the performance funds, proposing that the universities be financially punished if they do not report the number of embryonic stem cells they use in research, if they require students to purchase health insurance and if they allow students to intern at nonprofits that encourage them to protest local businesses. Rep. Joan Bauer (D-Lansing) said the additional requirements "use performance funding... in the wrong way." The stem cell condition originates from a disagreement between the committee and the University of Michigan —the only university in the state to conduct research using embryonic stem cells— on how U-M should be required to report on their research. The subcommittee wants U-M to provide the exact amount of stem cells it's using for research purposes, but U-M says its projects are too comprehensive for unfiltered data to accurately portray its stem cell research enterprise. "Even though we were asked specific questions we don’t collect the data in this way and we think that focus on these issues, these specific little issues, were trivializing the complexity" of stem cell research, U-M President Mary Sue Coleman said recently. "I want to continue to put this in context.... We are doing this according to the strict regulations of the federal government." During the subcommittee meeting Friday, Bauer said the higher education budget is not the place to play-out the stem cell debate. "The citizens of Michigan were extremely clear when they voted a few years ago" to allow embryonic stem cell research, she said, referring to a 2008 ballot measure. The health care language was added in response to a provision passed by Michigan State University that requires incoming students partake in health insurance. The protest language was added in response to a handful of U-M students protesting a local business in Detroit with a nonprofit they interned with. "They're punitive," Bauer said of the three additional imperatives added and supported by subcommittee Republicans. "This is yet another attempt to micromanage our public universities who, by the way, according to the last time I read the state constitution, are autonomous." Subcommittee chair Bob Genetski (R-Saugatuck) reminded the committee that "no university will lose any base funding that they had last year" if they fail to comply with performance funding regulations. They will lose out on funding increases ranging from .09 percent to 7.4 percent. This year's higher education budget allots universities $836 per standard bachelors degree cost per year. The $1.4 billion higher education allotment is a 3 percent increase from the 2011-2012 budget but still more than 10 percent less than universities were awarded in 2010-2011. During the subcommittee meeting, Genetski said he would like to offer more money to public universities but that doing so currently is not a fiscally responsible move. Sun, Apr 1, 2012 : 12:45 a.m. Sat, Mar 31, 2012 : 5 p.m. I thought the Tea Party promised us they would't push out-of-touch, ultra-rightwing social agendas? How on earth does this help improve the economy or create jobs? Sat, Mar 31, 2012 : 2:35 p.m. So much for local control, religious freedom, personal responsibility (the legislature is asking Other People to cover medical bills for the students) and job creation. What other core GOP principles can our MI GOP flip flop on? Turns out their campaign slogans are just that, slogans. Sat, Mar 31, 2012 : 2:18 p.m.
Tell the Michigan House subcommittee to stick it! Go it alone and ask for contributions to continue this research. I'll donate and so will many others. Sat, Mar 31, 2012 : 1:55 p.m.
Once again Ann Arbor's herd of independent thinkers speaks with unanimity. Sat, Mar 31, 2012 : 2:48 p.m.
A little history of the &quot;independent thinker&quot;: (I think a term coined in modern usage by Rush Limbaugh) The IT's KNEW there were wmd's in Iraq. Are convinced that Anchor Babies are the cause of our deficits. KNEW President Obama was born in Kenya. KNEW Obamas school speech was going to indoctrinate youth into Marxism. told us Obama was going to tax my guns. thinks Supply Side economics works. And can parrot Talking Points better than anybody else. Drill, baby, drill! Sat, Mar 31, 2012 : 1:48 p.m. The ideologically driven republican legislature is not being good for our state. Are we getting tired of being governed by a group of people who are so driven by their political and religious beliefs that they can not view the broad needs of the state? So far this legislative body has struck down major human rights, has supported charter schools to the expense of the public schools, has attempted on numerous occassions to duplicate already existing laws both federal and state regarding women's health and along with the Governor has been and continues to make decisions that are detrimental to the growth and future viability of our state in terms of education and jobs. Cutting taxes for corporations and increasing taxes on those who are least able to afford them, cutting funding for schools and inserting ideological mandates as conditions for fundings is not only reprehensible, but it is also not responsible governance. Michigan's economic recovery isn't because of actions taken by the Michigan Legislature, but is inspite of. We need to really carefully consider what we want for our state and I don't think what we have is working very well. Sat, Mar 31, 2012 : 1:41 p.m.
How much more would the legislature like to be involved in university matters? Should funding be reduced if the football team doesn't run the ball enough for their liking? Sat, Mar 31, 2012 : 5:33 p.m.
Technically, the UofM athletics department is self funding and has an independent budget from the educational mission of the University. Not that the legislature couldn't poke their sticks into the educational budget for that reason, but they'd have to specifically attack the athletics department to affect that department. I agree with your sentiment, though. Sat, Mar 31, 2012 : 11:48 a.m. So it turns out the House committee members can't read either. Maybe one of their aides could read them the MANDATE voted on by the citizens of the state. Sat, Mar 31, 2012 : 11:23 a.m. This is a bad road to go down. Sat, Mar 31, 2012 : 1:39 a.m.
Once again the religious zealots are trying to force their particular beliefs on the majority by throwing up roadblocks against the implementation of a policy favored by the majority. Sat, Mar 31, 2012 : 1:24 a.m.
Bottom line...voting does matter. I hope people begin to realize that not voting allows these fringe groups to take control. Please get out this fall especially you younger folk. Sat, Mar 31, 2012 : 1:22 a.m. If the universities really want to be autonomous, they should forego the money. Whoever gives the money gets to attach the strings. That's the way it's always been and always will be. Sat, Mar 31, 2012 : 3:43 a.m.
Public Universities ARE autonomous. Check the State Constitution if you need to verify this FACT that the republicans continue to ignore. Sat, Mar 31, 2012 : 1:17 a.m. Note to the TeaPublicans...Try science, it works! Fri, Mar 30, 2012 : 10:31 p.m.
Our legislature IN ACTION ! Creating jobs. Yeah. Political/ religious dogma ahead of jobs - as usual. Vote these clowns out! Fri, Mar 30, 2012 : 9:54 p.m.
Fri, Mar 30, 2012 : 9:39 p.m.
&quot;if they allow students to intern at nonprofits that encourage them to protest local businesses&quot; can someone explain what this means? this is the first i have heard about this... i'm curious to know the pros/cons of this issue. Fri, Mar 30, 2012 : 9:27 p.m.
Fri, Mar 30, 2012 : 9:07 p.m. Comments here would be quite different if experimentation on furry little animals was in question. Fri, Mar 30, 2012 : 9:38 p.m. These are cells that would be flushed. Critical thinking might help! Fri, Mar 30, 2012 : 7:03 p.m. Yes, the Republicans are the party of less regulation and more jobs. Well the Stem Cell issues show how they tack on needless regulations that lose research jobs to states that relegate religious dogma on Science to Sundays. I am surprised that they haven't yet proposed teaching Creationism in public schools. Sat, Mar 31, 2012 : 1:20 a.m.
Fri, Mar 30, 2012 : 7:57 p.m.
No kidding, along with some language about how Evolution is just a &quot;theory&quot;. Fri, Mar 30, 2012 : 7:02 p.m. Yet another attack on the autonomy of Public Universities ... the republicans in Lansing continue to violate and disregard the State Constitution as they push their right-wing social issues and threaten to withhold state funding. Vote these crazy GOPers out in November! Fri, Mar 30, 2012 : 6:24 p.m.
Let the members of this subcommittee pay the medical bills of the MSU students who don't have insurance. Fri, Mar 30, 2012 : 9:58 p.m.
i just wounder how many students that go to college parents can not afford insurance on them. i am willing to bet the percentage is so so low it is a joke.? Fri, Mar 30, 2012 : 6:07 p.m.
That's what the UofM gets for doing ESC research and wasting $$ on fraudulent science. Meanwhile the rest of the world is making huge leaps and strides in Adult Stem Cell and IPS work, the culture of death and liberalism clouds scientific research at UofM. Fri, Mar 30, 2012 : 6:01 p.m.
Troglodytes 1 - UofM 0 Making Michigan the Mississippi of the North! Fri, Mar 30, 2012 : 6:21 p.m.
What do you have against Mississippi? Fri, Mar 30, 2012 : 5:44 p.m.
Dumb, dumb, dumb! Super Dumb in Lansing for starting this, and dumb at the UofM for not answering the question. Fri, Mar 30, 2012 : 5:09 p.m. Interesting. Why do the state Republicans hate the state constitution so much that they disregard it? Fri, Mar 30, 2012 : 7:27 p.m. They hate our Freedoms and the State Constitution apparently. 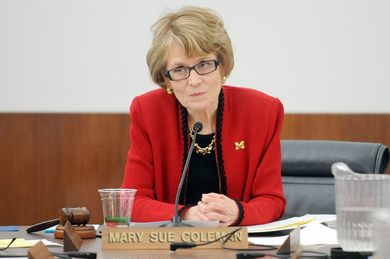 Fri, Mar 30, 2012 : 4:42 p.m.
&quot;Even though we were asked specific questions we don't collect the data in this way and we think that focus on these issues, these specific little issues, were trivializing the complexity&quot; of stem cell research, U-M President Mary Sue Coleman said recently. &quot;I want to continue to put this in context.... We are doing this according to the strict regulations of the federal government.&quot; Gobbledegook. Typical. Fri, Mar 30, 2012 : 4:41 p.m.
What is the left's obsession with ending life??? Sick. Fri, Mar 30, 2012 : 9:52 p.m.
Fri, Mar 30, 2012 : 6:02 p.m.
Why is it that you don't understand that these embryo's will be flushed down the toilet? And you prefer flushing to research because...? Fri, Mar 30, 2012 : 5:08 p.m.
Embryonic stem cell research saves lives. Not researching it because you think a fictional character told you not to is sick. Thanks to the Party of Rick Snyder for their Stone Age Anti-Democracy pandering to the lunatic fringe of politics. Where is wimp Snyder who told us he had Stem Cell Researcher's backs? Fri, Mar 30, 2012 : 5:13 p.m.
Fri, Mar 30, 2012 : 4:19 p.m. The lunatic's in Lansing strike again. Vote these crazy GOPers out! Sat, Mar 31, 2012 : 3:32 a.m. If only we could vote the Republicans out without voting the Democrats in. Fri, Mar 30, 2012 : 5:16 p.m.